It's been more than a year since Samsung unveiled the Galaxy Mega 5.8 and 6.3 and it's high time we see their successors on the market. The Samsung Galaxy Mega 2 has been around the rumor block time and again with hints of specs and shots but today we have both thanks to an image we received. 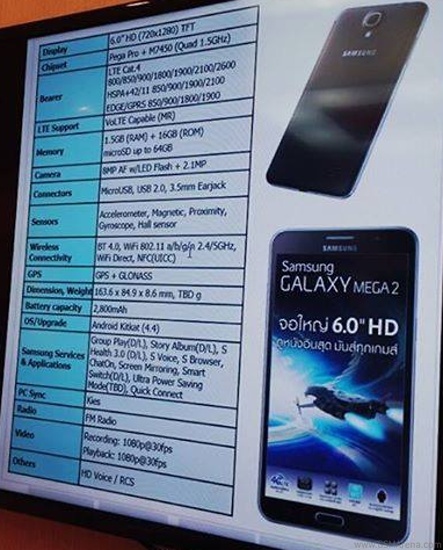 It appears to detail the specs of the Samsung Galaxy Mega 2 - a 6" 720p display, 1.5GB of RAM, expandable 16GB storage, 8MP camera with LED flash on the back and a 2.1MP snapper on the front. LTE connectivity with VoLTE support, a 2,800mAh battery, FM Radio and Android 4.4 KitKat are also listed. The only thing that's hard to read is the chipset - it's quoted to have a quad-core 1.5GHz processor inside. However some of the specs contradict what we've seen before. A TENAA listing has the Galaxy Mega 2 with 2GB of RAM and not 1.5GB. The dimensions of the device are exactly the same though, which could indicate the new source is legit or that it has copied some of its information from the earlier leak. Getting two different versions of the Galaxy Mega 2 isn't out of the question either. There's no way for us to verify the legitimacy of the image until Samsung proceeds with the actual announcement, so don't take anything for granted at this point. Thanks to our anonymous source for sending this in! Very nice but so huge...will rather get a Samsung Galaxy Note 4 or just the Samsung galaxy Tab S. The Samsung Galaxy Tab S gives more feature wize and the Samsung Galaxy Note 4 is muuuuuch better.